Recently, Rich Coluzzi, President of RJC Designs Inc., presented at a WHYY sponsored event for the local chapters of SMPTE (an organization for motion picture and television engineers). This event was to introduce the projects development team including project architects KSS, and supporting manufacturers including AMX, Community Pro, Broadcast Pix, and the technology integrator Vistacom Inc. Host Chief Technology Officer at WHYY in Philadelphia, Bill Weber, presented with an opening overview of the new Dorrance H. Hamilton Public Media Commons (PMC) and the role this facility will have as a premier forum in the community and in conjunction with WHYY's broadcast facility. The project team members each presented their specialized roles and process in the project. 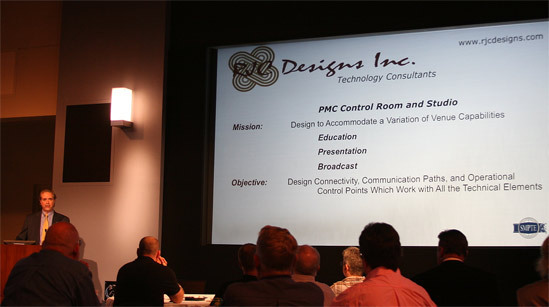 RJC Designs, as the projects technology consultant, presented on their design approach in successfully completing the mission of the PMC to operate as a presentation, education, and broadcast venue. Rich Coluzzi of RJC discussed how these elements would work independently or seamlessly together while also having connectivity to the principal digital broadcast facility. Also discussed was their role in the coordination of technology and structure.